Which one of the Daniel Craig Bond 映画 do あなた like the most? I have a full set of the bond 映画 on laserdisc all the way up through Golden Eye. They are in PERFECT condition and I need to sell them (Though I would rather not) anyone interested? Does anyone 愛 Sean Connery as James Bond and doesn't like any of the others? When I had first 投稿されました コメント about the 2002 James Bond movie "DIE ANOTHER DAY" on message boards and forums, I found myself face to face with a surprise. Apparently, many ファン found Halle Berry’s performance as NSA Agent Giacinta “Jinx” Johnson unsatisfactory. And after perusing もっと見る of the James Bond message boards, I also learned that Berry is regarded によって many Bond ファン as ”the worst Bond girl” in the franchise’s history. Before I had sat down in a movie theater to watch the latest James Bond movie, "SKYFALL", it occurred to me that four years had passed since the last movie about the MI-6 agent. During those four years, EON Productions endured another round of legal entanglements regarding the Bond franchise, delaying the production and release of "SKYFALL" によって at least two years. But in the end, producers Barbara ブロッコリ, ブロッコリー and Michael G. Wilson came through and released the company's 23rd James Bond film. I am going to be perfectly frank. I had hesitated to write this review of the 2008 James Bond movie, ”QUANTUM OF SOLACE”. Why? Because it has left me in a daze.Four days have passed since I saw the movie and I am still experiencing slight feelings of confusion about it. I had considered delaying my review until a 秒 viewing, but I decided to go ahead and write my first impressions of the film. Before watching my DVD copy of 2006’s ”CASINO ROYALE” for the upmteenth time, I had assumed that my initial enthusiasm toward the 21st James Bond thriller would dim with time. I felt certain that I would have enough of the fictional British Secret Service agent. Needless to say, my assumptions proved to be wrong. I managed to enjoy ”CASINO ROYALE” もっと見る than ever. 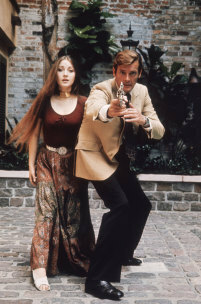 It has become firmly entrenched as my 秒 お気に入り Bond movie of all time, following 1969’s ”ON HER MAJESTY’S SECRET SERVICE”. "What do あなた have planned now?" Bond asked Q.
Q pulled a tarp off of another car revealing a brand new Camaro. "What do あなた think?" I must admit that when I first saw "THE WORLD IS NOT ENOUGH" in the theaters a little over seven years ago, I was not impressed. Well, to be honest, I did not like the movie at all. But after my 最近 viewing, I could not help but wonder if I had allowed my mild dislike of the 前 Bond entry, "TOMORROW NEVER DIES" to spill over in my view of the Bond franchise’s 19th entry. The technician was too busy with his work, and didn't here what Hatata had 発言しました to him. "Have あなた came up with new launch codes?!" The colonel asked again, もっと見る louder this time. "Then あなた need to hurry up with your work. We must get them back as quickly as possible."